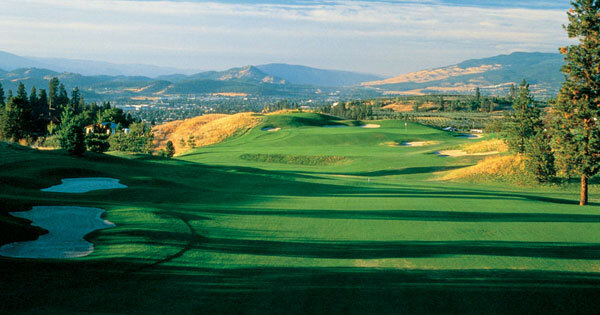 This semi-private Kelowna golf course was designed by the renowned designer Les Furber, and was finished in 1996. Since then, golfers have started to love it, as it provides them with just the right amount of challenge while remaining quite relaxing. Beginners can feel in their element, as the Pinnacle Course is made to be gentle enough for them. If there's anything you need before the game, be sure to visit the club's pro shop. There you will find a large variety of items, from golf equipment to accessories for the game to clothing items for both men and women. If you don't want to purchase equipment, and you would rather rent it, the shop can accommodate that as well. Lastly, if you'd like some leisure items or some souvenirs to remind you of the experience, they're all there waiting for you. Lessons are offered at the Pinnacle course. You can choose to be taught one-on-one for $85 an hour, $225 for three hours, $430 for six hours, or $840 for twelve hours. The more students you bring with you, the less each will have to pay. For example, the rate for one hour for two students is $50 per person, while it’s $40 per person for three students. The last option, for four students, comes at the cost of $35 per individual. Becoming a member will grant you a number of privileges. As a member, you can get full play and full use of the facilities at the clubhouse privileges, which means that you can practice the game on your own. As such, you will be able to take advantage of the putting greens available, the chipping area, and the practice bunkers. At the end of your practice, you will probably find yourself feeling hungry. If that’s the case, the Canyon Bar & Grill is there to relieve the hunger for you. You can be assured that you will be served only the freshest produce. You can also feel comfortable knowing that all the food you're getting comes from local sources. The menu offers a variety of delicious items, such as Caesar salad, chicken wings, goat cheese and arugula pizza, ravioli Florentine, and many others. The staff is friendly and always ready to help, and the entire package is completed by a gorgeous view. During the summer months, you can enjoy your food on the patio, from where you can watch a variety of events with your friends. These events will be displayed on large screen TVs, so you never have to worry about not being able to see. The Pinnacle Course, though devoted to golf, is not made just for the game. If you have an event you'd like to host on the course, the option is open to you. The amazing scenery will create the perfect background for stunning wedding pictures. It also provides a great space for outdoor ceremonies. If the weather isn’t on your side, the location definitely will be! The patio is open for use in case of rain, so your guests will be safe from the weather. If you wish to hold a meeting or a banquet, the staff can accommodate up to 150 individuals. You'll get professional staff taking care of everything. All you have to do is give the specifications. Surrounded by orchards and amazing vineyards, this course cannot help but stand out as an amazing location. From the course, you'll be able to see ponderosa pines towering over their surroundings. Below, you'll be able to see the vast expanse of the canyon. The 9-hole course was carefully designed to allow beginners to improve their game, and more experienced players can take the opportunity to relax on this course while enjoying leisure golfing. The Pinnacle Course will provide you with just the right amount of challenge if you're a beginner. However, the real showstopper is the view, which will amaze you. Having so much natural beauty in front of your eyes will be an experience you'll never forget. The region has a lot to offer. Whether it's golf you're interested in, or another type of information, such as Kelowna real estate, you can find it all on our blog at www.kelownaproperties.com/blog/.